Wine of Cave De Tain, France. Les Hauts de Pavieres is produced from vineyards lying on the left bank of the river, at the heart of the renowned northern Rhône Valley. 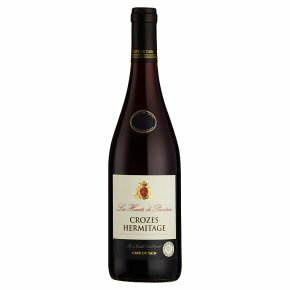 Made from best quality Syrah grapes, this classic French fine wine is medium-bodied, deep in colour, with aromas of red and black berry fruits, freshly ground pepper and a rich, smooth finish. Served at room temperature, it is a perfect match with roast turkey, pork, sausages, meat casseroles or mature, flavoured cheeses.